Preheat oven to 400 degrees. Wash and dry the butternut squash. Carefully cut the squash in half lengthwise. Cut each half into two pieces and scoop out the seeds. Place the squash on a sheet pan, drizzle with olive oil and salt and pepper. 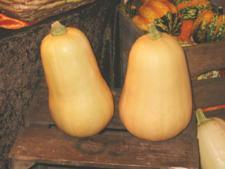 Roast the squash in the preheated 400-degree oven for 30-40 minutes or until tender. When the squash is tender, take it out of the oven and let it cool until you can pick it up and peel the skin from the squash. Put the pieces of the squash in a food processor until all pureed. In a saucepan, combine the vegetable stock, the 2% organic milk and the pureed squash, and bring to a simmer. Add salt and pepper to taste. Once the soup has simmered for 5 minutes, add nutmeg, cinnamon and ginger to taste. Garnish the servings with fresh minced parsley and cinnamon.... enjoy!